As part of the celebration of Pink Floyd's sweeping Why Pink Floyd? 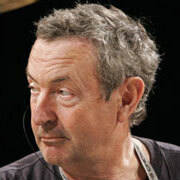 release campaign with EMI, join us as we welcome Pink Floyd drummer Nick Mason to the Clive Davis Theater. As the only constant member of Pink Floyd since their formation in 1965, Mason helped catapult the band into worldwide superstardom. Progressive rock classics like The Dark Side of the Moon, The Wall, and Wish You Were Here have solidified Pink Floyd as one of the most successful and iconic acts of all time. Hear Mason, joined on stage by executive editor of Yahoo! Music and former editor of CREEM, Dave DiMartino, in discussion about his extraordinary career as one of the world's most loved percussionists, his adventures outside of music and onto the racetrack, and how it feels to have sold more than 200 million records worldwide. After the interview, Mason will take questions from the audience.